Cooling systems are must-have tools for jewelry and lapidary work, stained glass and mosaic tile artists, and any craftsperson who needs to custom-cut and shape difficult materials. #86794 Professional-Quality 10 Inch Variable Speed Disk Sander for smoothing, polishing, de-burring and beveling of hard and soft wood, non-ferrous metal, steel, plastic (also plexiglas and fiberglass reinforced plastics), cork and rubber. Sands long edges, end sections, radii, miters, and accurate flat surfaces at right angles. Comes with miter gauge and a silicon disk attachment which allows sanding disks to be easily removed and replaced. Includes 2 each 80 and 240 grit aluminum oxide sanding disks. High-quality, made in Germany. 2 year warranty. 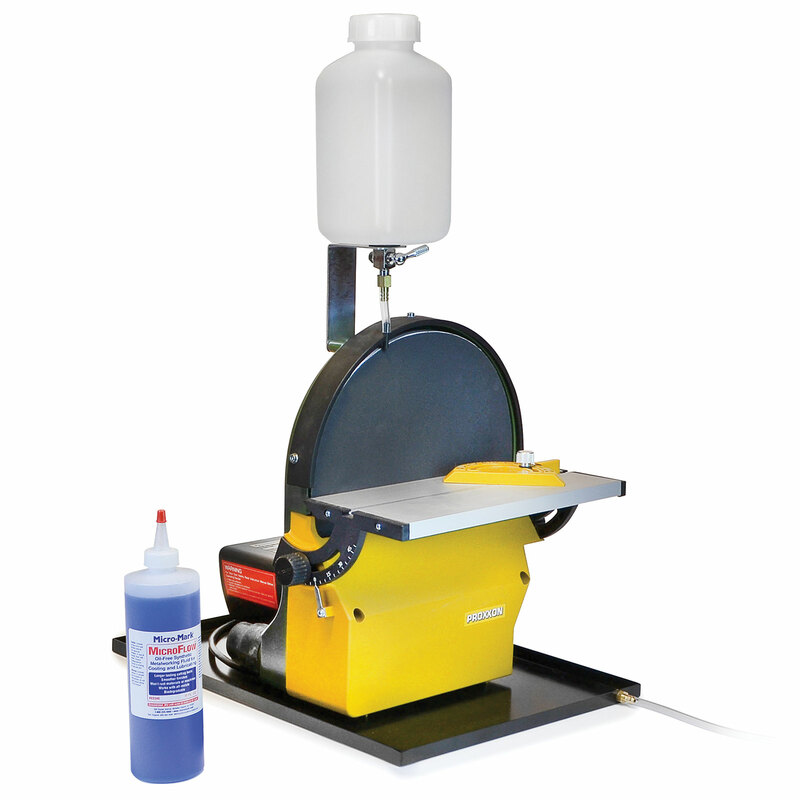 10" Sander features: Speed 820 to 2,460 ft/min (belt drive 7.3:1 reduction ratio) • disk diameter 9-7/32" (250 mm) • max. sanding height: 5-5/16" (135 mm) • table size: 10-13/16" x 4-1/8" (275 x 105 mm), adjusts 15 degrees in, 45 degrees out • overall size (without table) 13" x 11" x 9" (330 x 280 x 230 mm) • volts 110 - 120VAC, 60Hz. #82212 Cooling System includes reservoir, adjustable valve, tubing, gasket and collection tray for water-drip cooling of sandpaper and workpiece. Necessary when sanding hardened steel tools, stone, ceramics, tiles, glass and other hard, heat-generating materials. Must be used with waterproof sanding disks.